Histology For Pathologists - ubiq bookshop: the best place to buy books! A strong grounding in basic histology is essential for all pathologists. However, there had always been a gap between histology and pathology in which histologic information specifically for the pathologist was often lacking. Histology for Pathologists deals with the microscopic features of normal human tissues, from the perspective of the surgical pathologist. This is the only text that uses human (vs. animal) tissues for the histology. It is the best reference in the literature for information on normal histology, and, as such, is essential for all clinical pathologists. 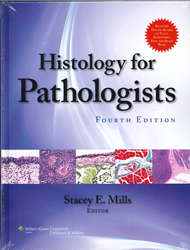 Written by pathologists for pathologists, the new edition will update the pathologist's understanding of normal histology up to date with the incremental advances made in the last five years. The 3rd edition has become a "classic" purchased by virtually all residents beginning their pathology training, as well as pathologists in practice. The 4th edition will build on that substantial foundation. The table of contents will remain essentially the same with the exception of some changes in authorship. Featured in the September 2012 Mostly Medical newsletter.